How an Electrical Engineer Spends "Vacation"
Scott Adams' Dilbert character was born not out of some abstract impression of the stereotypical engineer, but of the tendency - sometimes tragically - of an individual's life vocation to reflect his innate tendencies and preferences. Having myself been born with at least some level of manifestation of that well-documented genetic trait known in the medical community as The Knack, I tend to spend my spare time indulging in things technical. That can run the gamut of subjects from tearing apart electromechanical devices, to building model boats, rockets and airplanes, renovating houses, working on cars, building and restoring clocks, reading books on physics, astronomy and mathematics, and maybe tending to watch TV shows like Numb3rs and Built It Bigger. Now that the kids are grown, college educated, and married, vacation time consists of not only maintaining our (Melanie and me) own stuff, but also helping out with the kids' stuff as well. In October, we drove down to Greensboro, NC, to visit my daughter, Sally, and her husband, Matt, at their recently acquired horse farm. 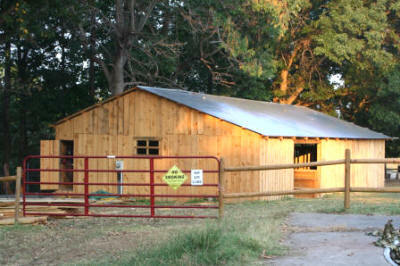 They bought it in May of this year and by the time we arrived, with the help of some friends, had totally razed an old, dilapidated 3-stall horse barn and hay barn and erected from their own plans a 60x40-foot, 7-stall horse barn (with tack room and office) and a 12x40-foot hay and equipment barn. 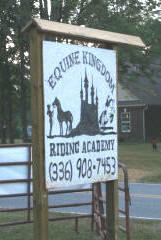 Sally has been riding and instructing for about eight years and has built an amazing riding school on her own, while boarding at other facilities, and now finally has her own place - Equine Kingdom Riding Academy. Matt just graduated from UNCG with a degree in biology and is a certified dog trainer, so a kennel and training facilities will eventually inhabit the property as well. 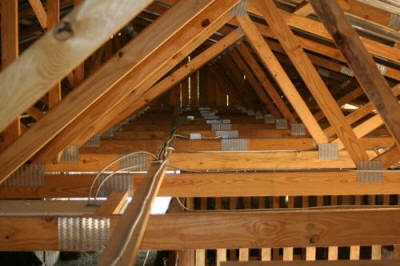 Having begun my career many moons ago as an electrician through vocational school and a couple years of practice, then entering into electronics through the USAF, then earning a BSEE degree, I have kept up electrical wiring skills through the year while renovating many houses and doing wiring for other people as a favor. 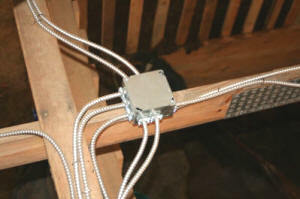 So, when the barn was ready for wiring, I was ready to wire it. Since Melanie and I now live in Erie, PA, the initial planning was done via e-mail exchanges and phone calls to get dimensions and preferences. Wiring diagrams and parts lists were created just like I am accustomed to doing for projects on engineering jobs. The kids considered it at least slightly obsessive compulsive personality disorder-like in nature considering their work was done in a rather ad hoc manner, but my limited availability justified such an approach. After a few trips to the local Lowe's home improvement store, I was able to supply a complete parts list that included item description, quantity, Lowe's stock numbers, and even URLs for every component. Then, they handed the list to an employee in Greensboro and came back later to pay for and pick up everything. It worked like a charm, with only a couple trips necessary during the execution phase for parts needed to accommodated Sally's requested changes. An overhead duplex receptacle above each stall, with switch control (for fan or heater). 500 W halogen floodlights at both entrances and facing the horse wash pad (switches mounted inside). 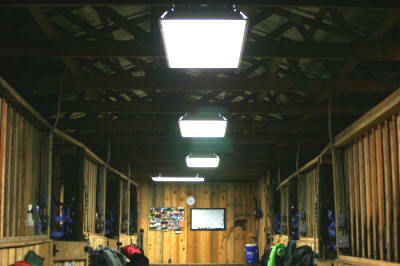 3-bulb, motion/light sensor-controlled floodlights at all 4 corners of the barn (disabling switches mounted inside). Decorative porch wall light at office/tack room door. All receptacle circuits protected by ground fault interrupter (GFI) circuit breakers. Light and receptacle circuits separated per NEC. 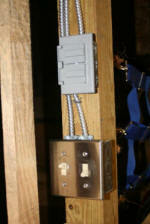 Multiple circuits for each to prevent one fault from disabling entire barn. Circuit load planned for no more than 50% of breaker rating under normal conditions (lots of overhead for additional current demand). 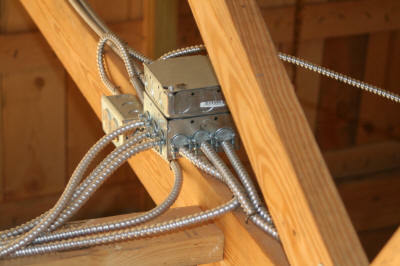 Metal device and junction boxes used throughout for ruggedness, fire prevention, and immunity to varmint attack. Metal-clad cabling (12/2 THHN w/separate integrated ground wire) and approved connectors and insulator bushings used throughout for same reasons. Grounding screws connected on all devices and boxes per NEC. Underground feeder circuit run to hay /equipment barn. GFI protection provided at load end. Now, while I have always been pretty good at the planning and execution phases of projects, estimating the time needed to accomplish each task (I hate making schedules) has always been my weak point. Such was the case here as well. I figured that out of the four full days that Melanie and I would be visiting (plus a day each way for travelling 650 miles), it would take a day to mount all the boxes and fixtures, then another day and a half for wiring. Well, that estimate might have been good if plastic-sheathed Romex type wire was being used (standard house wiring). However, installing the metal clad wiring involved carefully cutting through the wound armor without nicking the wire insulation inside. There is a trick to doing it, and I am well practiced in doing it from my former life as an electrician wiring commercial buildings, but it takes at least twice the time for making each connection to a box or fixture than does the simpler Romex that requires only stripping with a knife. Oh yeah, there is also that obsessive compulsiveness issue that always tends to slow me down. For some reason I possess an innate compulsion to keep everything as straight, plumb, horizontal, parallel, and perpendicular as possible. It could be labeled a personal pride thing, but the Freudian psychoanalytical community's diagnosis would probably be more apt in my case. For all the above reasons, the job actually took four full days, with the last splice being made at around 9:00 pm on the evening before we headed north back to Erie. I figure that I put in a little over 50 hours in four days, and that is with help from Matt for half the time. There is great satisfaction in completing the job, then standing back and surveying all that which you have created. There was one short in the entire job, and that was not a hot-to-neutral or hot-to-ground type of short, but rather one between the ground and the neutral in one receptacle box. That kind of short is only noticed in a GFI-protected circuit. Had it been on a standard circuit breaker, it would never have manifested itself. You might be tempted to think that having the neutral shorted to the ground is not really a problem since, after all, the grounds and neutrals are bonded together back at the circuit breaker panel. It does create a possible hazard, though, since it presents an opportunity for some or all of the current from the hot wire to return via the ground wire, which is only truly at ground potential back at the panel (due to conductor resistance). If there is an open neutral somewhere in the circuit, an otherwise ground potential wire can be carrying all or part of the circuit's return current - a job normally assigned to the neutral wire, and the very condition which a GFI circuit is designed to protect against. So, in the end, while Sally and Melanie did daughter-mother things all week and Matt divided his time between his full-time job and helping me, I spent my entire "vacation" from morning to evening wiring a couple barns. Though my 50-something back was aching, fingers were utterly sore from cutting cable, twisting wire nuts, hammering staples, and turning screws, I count it time well spent. A few months from now we'll tackle adding switches and receptacles to the human barn (primary residence), and maybe run a new waterline out to the horse barn. Here's the most interesting thing about the whole experience: As I was installing the final piece of armored cable between a junction box and an overhead stall light, it was exactly long enough to complete the job. That is, I began with four, 250-foot spools of cable and had exactly nothing left over at the end. It took precisely 1,000 feet of cable - with no wasted lengths - to do the job. Kinda cool, n'est-ce pas?